Discussion in 'Price Drops, Must-Have Freebies, and Deals' started by Habakuk, Aug 8, 2016. Very recommended! 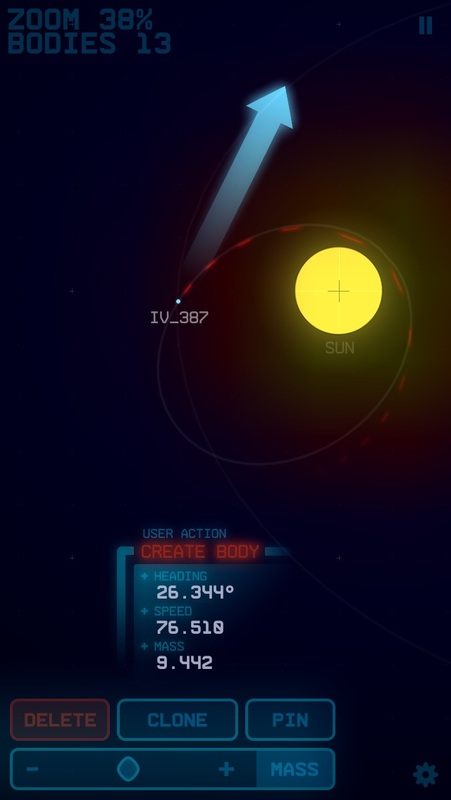 Have an unlimited number of complete solar systems in your shirt's pocket! Although it's sorted under the iOS App Store's category "Games" it seems to be more an educational application. There are no objectives, no highscore lists, no wins or losses; but fun enough! Full premium. Tested on iPad Pro (9.7"+12.9"): looks gorgeous, full retina. Load the factory presets and look what happens! The sale seems to be limited to a few hours only, so grab it soon. Almost unbelievable: Only seven (in numbers: 7.4) megabytes! 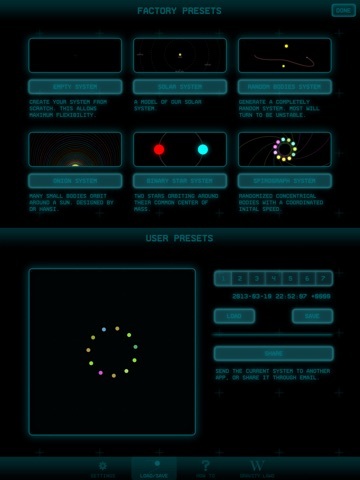 G is a Gravitation simulator designed for iPad / iPhone. 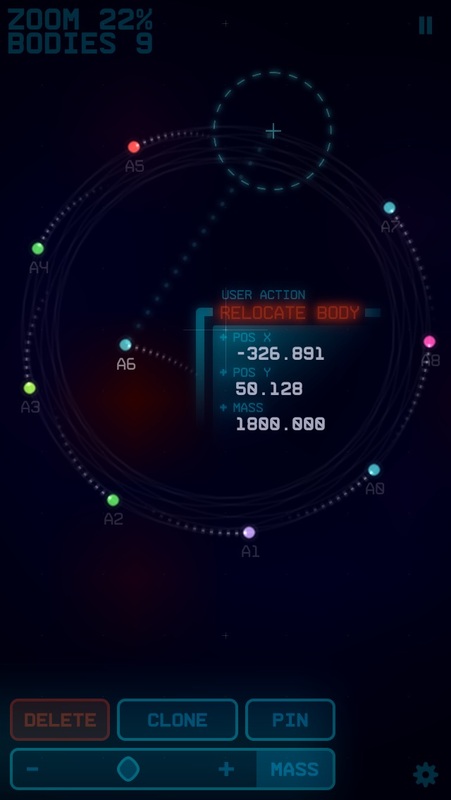 Check the demo video at http://www.gravityApp.info G allows you to quickly experiment the effects of the Universal Gravitation by adding bodies into a simulation, seeing how they react to each other in real time, all in a true multitouch environment. G offers a vast universe to add your bodies into, potentially allowing you to create stable planetary systems, binary star systems, and other multiple-body complex systems. G is very simple to use. 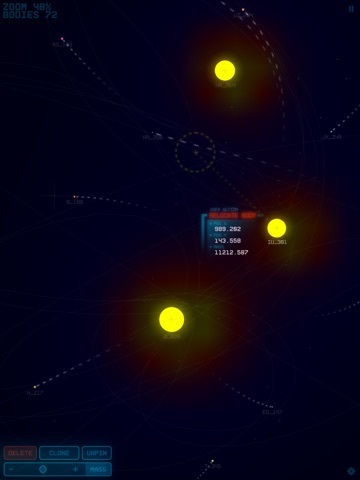 When you first start it, you are presented with the solar system. The Sun and all planets from Mercury to Uranus are added to the simulation, including the Earth's Moon. First, get familiar with how to navigate G's Universe. - Drag on empty space to pan around the universe - Pinch (two fingers) to zoom in and out the Universe. 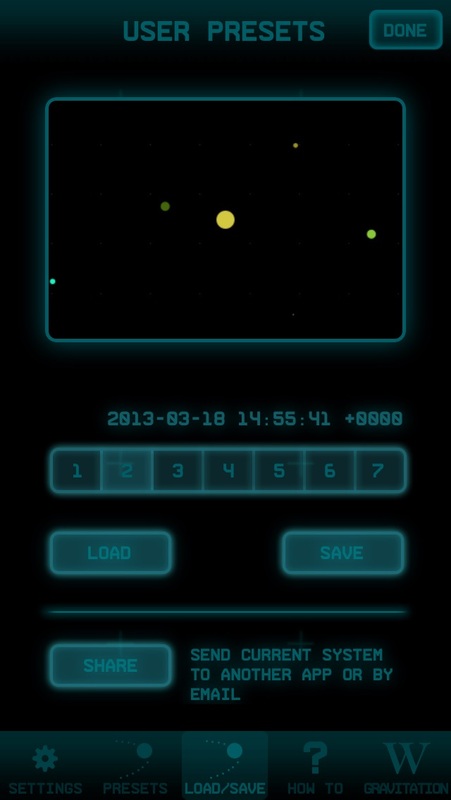 - Tap on a body to select it, making the camera follow it. 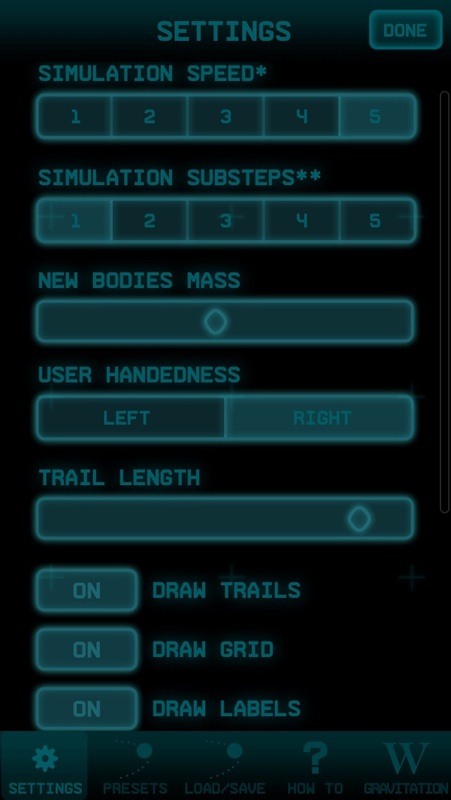 You can then start interacting with the system, by adding new bodies, modifying or deleting the existing ones. - Double-tap on empty space to create a body. - Drag after double- tap to set the new body's initial velocity. - Drag an existing body to relocate it. 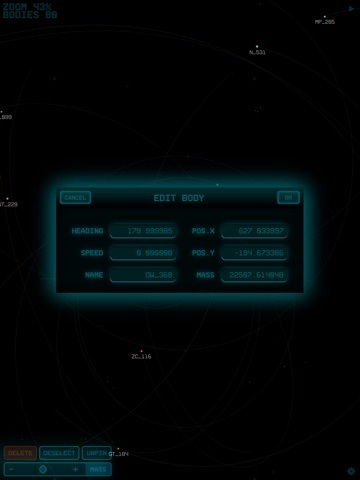 - Double-tap on an existing body to set a new velocity. The placement, the mass and the initial velocity of the newly added bodies will dictate how "successful" your system will be. Bodies in G will collide when in contact, so if one of your bodies hits another one, they will merge into a single body, creating debris in the process. Want to see what would happen if our Sun suddenly disappeared? 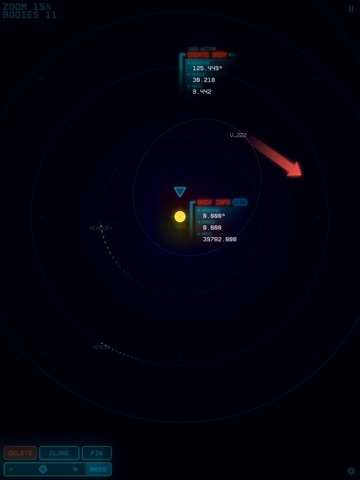 Just delete it from the simulation, and watch all the Solar System planets react to the change... What would happen if the sun decreased it's mass? Go ahead and try it, it's not pretty. 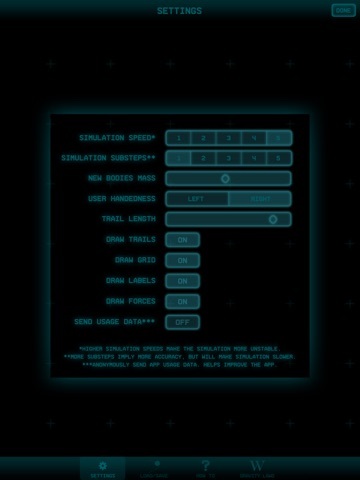 G provides a settings screen that allows to toggle various visual aids, (universe grid, body trails, etc), as well as the simulation speed. G allows you to store your systems to get back to them later. Up to 7 systems can be stored simultaneously, and loaded anytime. A screenshot of the system is also stored together with the date it was stored in. 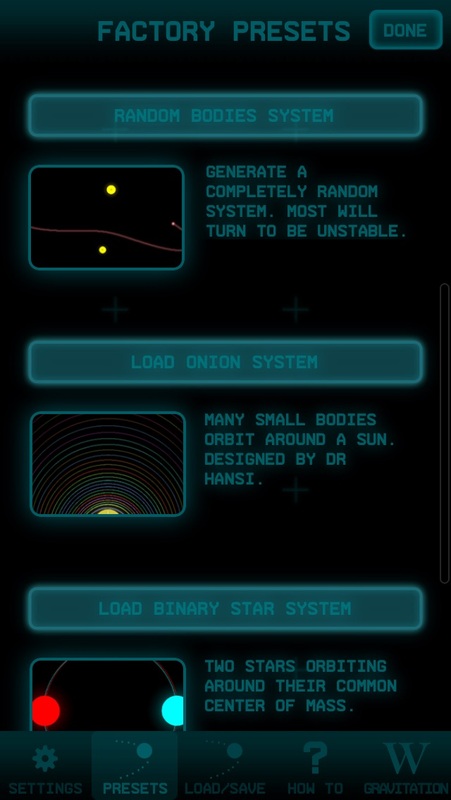 G also provides a few presets, including the Solar System, and a few other particular systems. You can also import/export your systems from/to any other app (Dropbox, for example) or email. The physics implemented in G follow "Newton's Laws of Universal Gravitation", which states that every massive particle in the universe attracts every other massive particle with a force which is proportional to the product of their masses and inversely proportional to the square of the distance between them. In case you are curious about Newton's Laws of Universal Gravitation, G provides a quick view of the Wikipedia's definition of such laws. Visit the dev's website for even more info and a very cute cat video. His YT channel has five more tutorial videos. The Wikipedia link inside the app doesn't work here.